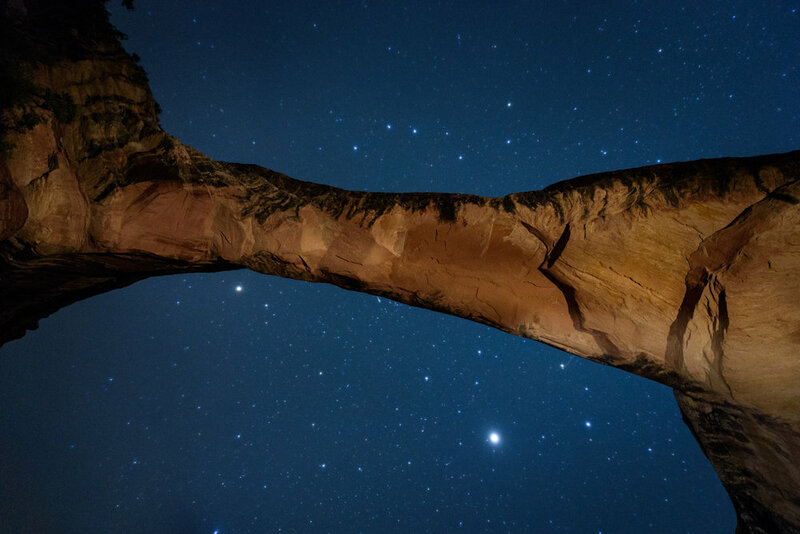 Natural Bridges is Utah's first National Monument, and the darkest sky in the U.S. National Park System. It's rated a Class 2 on the Bortle Dark-Sky Scale—no other U.S. park has that status. This was a 4-night, 5-day workshop. The adventure began at 10 a.m. on June 21 and ended with our group slideshow at 6 p.m. on June 25. This workshop is sold out. If you would like to be placed on a wait-list, please call RMSP at 800-394-7677. The primary focus will be around Utah’s first national monument, which features the three natural bridges that make up the park: Kachina, Owachomo and Sipapu. Sipapu is the second largest natural bridge in the United States. “In Hopi mythology a sipapu is a gateway through which souls may pass to the spiritual world.” Brave the 1.2-mile steep descent via wooden ladders and switchbacks to witness and capture this spectacular site. Kachina is the youngest of the bridges and is often hidden to most views from the overlook. Owachomo is probably the most popular of the three—it is accessed via a quarter-mile trail, and features a delicate arch that faces south and is perfect for framing in front of the Milky Way. 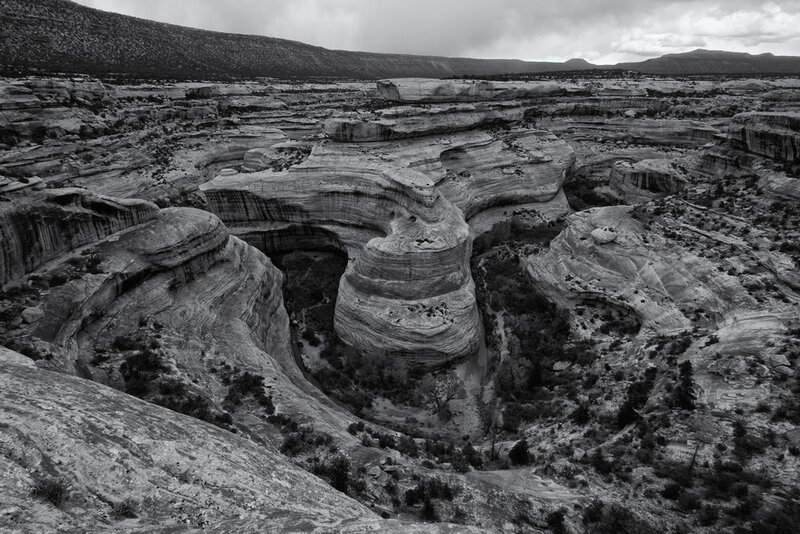 Also, we will have permission to photograph one of the best preserved ancestral Puebloan sites, Horsecollar Ruin, accessed via a short hike into the canyon. Additionally, we will visit and shoot Hovenweep National Monument—another amazing dark sky location featuring Pueblo castles and structures that have survived centuries. As the monument's website so perfectly states, "Hovenweep preserves a primordial dark sky largely unaltered by modernity." We will be able to visit the ruins during the daytime and photograph amazing night skies during the evening. This is a very hands-on workshop with the emphasis on honing your night skills and creating the most spectacular photographs once the sun dips below the horizon. We specifically chose the timing of this workshop to occur during the new moon. Star trails, star points, light painting and putting together awe-inspiring night panoramas are just the starting point. As a group you will explore the rim of the canyon plus descend to the bridges. We'll also demonstrate how we approach scouting for night photography and the tools used to help prepare for capturing the celestial skies. 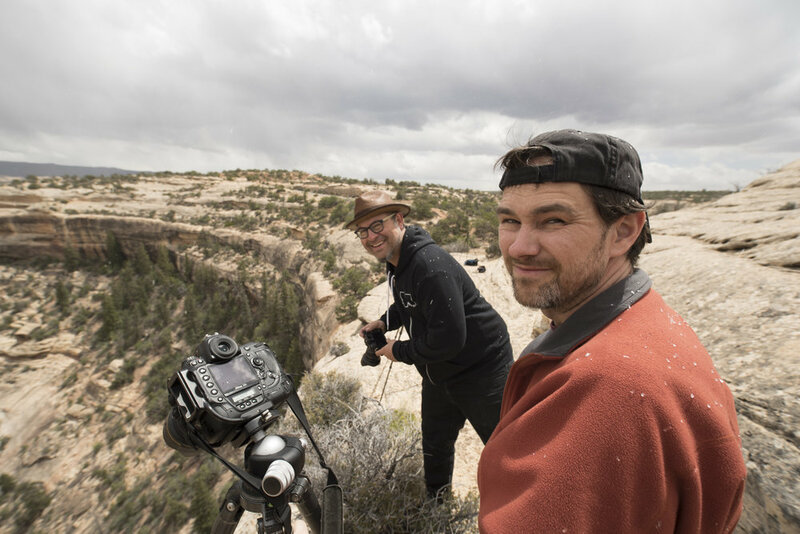 Throughout your time with the gregarious Gabe and Matt, our combined goal will be to spark your imagination, enhance your technique and work with you to produce some spectacular shots on this five-day/four-night workshop. You should be comfortable with the manual exposure operation of your camera. Be advised the hotel is one hour away from the monument—proper lodging is scarce in the area. We recommend car pooling and being sensible with how much energy you have left in the tank. There will be hiking, sometimes with steep passages, and climbing down wooden ladders in the dark. Please consider your physical abilities prior to registering. If you have questions, please contact us—we're happy to talk it over with you. When Gabe, Chris and I visited Natural Bridges in 2016, I was once again humbled by the variety of wild wonders that both Utah and America have to offer. I am drawn to Utah over and over again by the amazing geological features that—when combined with water, weather and time—provide a literal cross-section of the history of our land. And when, simply by chance of some stone being harder than others, a natural bridge remains to span a canyon's chasm, I wonder about the times when people traveled by horseback and how many of them braved the bridges as crossings during their journey. Now, of course, we cannot traverse those fragile spans, but we can admire them from above and below. The land encompassed by the monument includes a rim road. From this, you can stop and observe the bridges and carefully approach the rim of the canyon. Words alone cannot describe. Nor can photography. Join us to experience this location gem. I am smitten, and looking forward to sharing it with you.